The niche homebuilder market is wide open for building product brands. And we have a plan to attract this crowd. You might say there are two types of builders in the homebuilding market: Production Builders, who get the limelight, and Niche Builders, who often get forgotten. At 46% of the market, there’s no reason to forget this key group. But there is every reason to seek their loyalty. In this less uncontested space, you’ll find fewer competitors, less pricing pressure, new opportunities to build business and a willing ear for your message. But niche builders are interested in different points and often short on time. So it takes a custom approach to hold their interest. What should manufacturers do to succeed with this diverse crowd? We have a few ideas we’re willing to share. 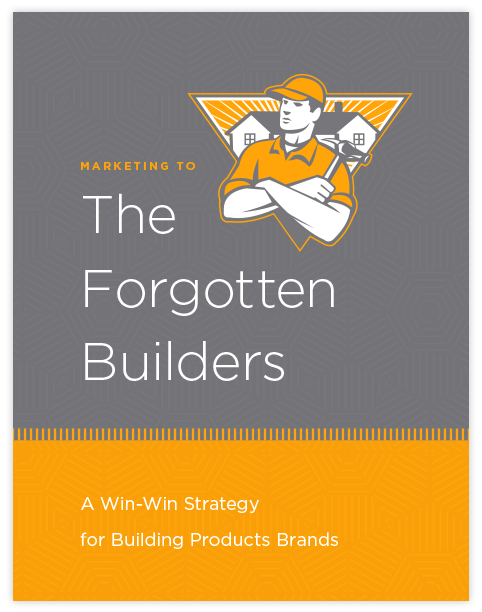 Read about them in our new ebook for building products manufacturers and their brands: “Marketing to The Forgotten Builders.” Fill out the form to the right and download our guide that details the opportunities to be gained in the niche building segment, and a marketing framework you can tailor to engage builders and their homebuyers. Complete this form to download our free eBook.